Before listening to the Buddha’s teachings, I sincerely ask you to give rise to the precious attitude of bodhicitta. The attitude of bodhicitta is that we aspire to realize mind’s pure nature, which is clear light, i.e., Buddha nature and, having done so, to be of immeasurable benefit to all sentient beings. This is the precious attitude of bodhicitta. Please give rise to it when you receive the instructions. If we have just a small run-in with impermanence, we get a small bit of renunciation, but if we have a big run-in with impermanence, we get big renunciation. That’s why impermanence is good – it’s a friend of Dharma. If we didn’t have impermanence, it would be bad. Impermanence is here and it is good to experience it, to deal with it. At the end of the song, The Sources of Power, Jetsün Milarepa sings: "There's a whole lot of power in my practice because whatever happens I adapt to it. There's a whole lot of power because in the end all appearances are my friends." We have to be able to adapt to any situations, especially to those of impermanence, and to realize how these situations are friends of Dharma practice. If we practice the Dharma and reflect impermanence a lot, then when we actually experience change just like Milarepa, it becomes something that is really good. As long as someone does not accept the fact that appearances and experiences are impermanent (mi-rtag-pa in Tibetan) and does not give up clinging to them as though they were permanent and real, renunciation cannot possibly be born in the mind of that person. As a result, he or she would defy any reason to seek liberation. Therefore, reflecting the truth of impermanence is very important in that it helps put the mind in the position to really want to seek the Dharma. Having understood impermanence of everything and having entered the Dharma, attachment to this life is reversed - ‘düs-byas-thams-chäd-mi-rtag-par-go-näs-tse-‘di-la-mngon-shen-log-pa-ying-go. Furthermore, contemplating impermanence again and again stimulates one’s faith in the Dharma and makes diligence one’s friend - gshän-yang-däd-pa’i-gsös-‘debs-brtsong-‘grüs-kyi-grogs-byed. Meditating on impermanence quickly removes attachment and aversion and creates the circumstances to realize the truth of the Dharma - shag-sdang-dang-myur-du-bräl-näs-chös-mnyam-pa-nid-rtogs-pa’i-rkyen-byäd-pa-ying-go. As long as one’s body is healthy, as long as one enjoys lots of pleasures in life, as long as one is surrounded by many friends and has no enemies or problems, one is not going to remember the Dharma. Therefore, impermanence is good in that it reminds us to practice the Dharma. Jetsün Milarepa spoke about this in the song he sang to the great business tycoon, whose name was Dawa Norbu. He was very rich, had a lot of servants, and a prosperous family. Milarepa ran into him and said, "Do you know that at the time of death you will have to leave all these things behind?" He sang a song called The Eight Things to Remember. It is another very good song. You’ll have to leave it behind you like an empty shell. Are you aware that this is what will happen? You’d do well to remember and keep it well in mind. Who will you turn to, not a refuge in this sorry world for you. Kin and dear ones, every last one. Empty-handed and stark naked you’ll depart. Then it’s fit for nothing more than to be put in the ground. You no longer have any power over your mind. You won’t even manage to get a little water down. I know the bliss of having no worldly goods. May it give you the boost you need to practise well. Selected Songs of Realization , translated by Jim Scott, Marpa Translation Committee, printed by AKTUELL-Copyshop, Hamburg, 1995, pages 12-14. Meditating on impermanence in this way is something that people need to do before they turn their mind to the Dharma, because it inspires and moves them to seek the Dharma. Meditating on impermanence while practicing the Dharma unfolds and increases followers’ ability to be diligent and finally it enables practitioners to realize the Dharma fully. By first meditating on gross impermanence, then seeing how impermanence is the way more and more subtle things arise and cease again, a diligent practitioner finally realizes that impermanence doesn’t really exist and in that way realizes the equal nature of all things, chös-mnyam-pa-nyid, which is emptiness. 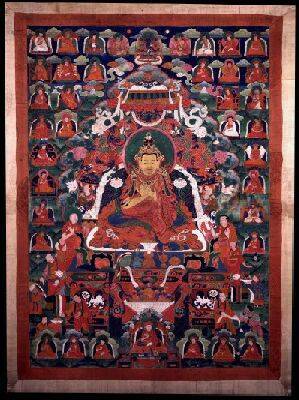 The Protector Nagarjuna said: "By knowing that things arise, we know that they cease. By knowing that they cease, we understand impermanence. By understanding impermanence, one realizes the genuine Dharma." This is to say that understanding impermanence leads to an understanding of emptiness, which is understanding genuine Dharma. let accomplishing and rejecting dissolve. let fixation on achieving some new result, let it go. is open, spacious, and relaxed. How delightful to have the whole host of thoughts be self-liberated. How happy it is when all thoughts are self-liberated. Student: I would like to ask a question. Rinpoche : There will be time for questions during the last teaching session. but the appearances of questions are mere dependently arisen appearances. then the doubting mind is self-liberated. There’s a whole lot of power in my view, free from extremes beyond concept. There’s a whole lot of power right here in the heart of what’s been pure from the very start. There’s a whole lot of power in my meditation, undistracted and reference-free. A whole lot of power is what I find in the great clear light, the great clear light. There’s a whole lot of power when I act, because whatever happens I’m relaxed. There’s a whole lot of power flowing easily when actions are naturally relaxed and free. There’s a whole lot of power in the result of pure reality recognizing itself. There’s a whole lot of power in the fruit of this great variety being naturally free. There’s a whole lot of power in my samaya of precisely following the Lama’s command. There’s a whole lot of power in my practice, because whatever happens I adapt to it. There’s a whole lot of power because in the end all appearances are my friends. I see all appearances are my friends. The story behind this song is that once Milarepa went to the place in Western Tibet known as Kha-ri Ti-se that we know as Mt. Kailash, which Buddhists consider being the sacred place of Chakrasamvara. The Hindus consider it to be the abode of Ishvara, and for the Bon (the native religion of Tibet) it is sacred as well. At that time there happened to be a very powerful Bonpo adept who was living there and had heard of Milarepa. When Milarepa came, he challenged Milarepa to a contest of miracles, and they had a spectacular contest of miracles - they did things like fly in the sky. In the end, Milarepa emerged victorious and the Bonpo adept remarked, "Wow, how did you get to be so powerful? What is the source of your incredible ability?" Milarepa sang him this song, saying: "The sources of my power are like this." In the Buddhist tradition, to have great power and ability and even the ability to perform miracles comes from having the profound view, meditation, conduct, and fruition, which are described in this song. It is a very good song and that is why we sing it. Question: It’s a question on the profound Definitive Meaning Song . Taking the first line, “Seer and seeing are refined until they are gone.” The seer and seen presumably are like dross. You were referring earlier to The Gyulama , saying that all things are refined, refined gold in gold-ore. In that case, the ore without the gold is the dross. So, I, the seer, and the seen are the dross, not the absolute. So gold is what is truly real. But seer and refining must be gold, so it must be what is truly real. You can’t refine gold until it is gone. The whole point of refining gold is watching that in the end it is gone, but you can’t find it until it’s gone. Therefore, it must be dross. So the first bit refers to dross, the second bit refers to gold, and the third bit seems to refer to dross. What I am interested in is the Tibetan because it doesn’t seem to be this? With conduct, when we have transcended a notion of someone doing something and something to do, then that is the best kind of conduct. With samaya (“the promise and pledge”), when we still have samaya to keep and someone keeping it, then that is called "samaya with a boundary," in the sense that there is a notion of conduct that is permissible and a notion of conduct that is not permissible. When you have that type of samaya, it is conceptual. In fact, the best samaya transcends the notion of there being anyone to keep anything and anything to keep. That is ultimate samaya. In Dzogchen it is called "samaya transcending boundaries." In Mahamudra it is called "undefiled samaya." Finally, in terms of the result, when you have a winner and something won, i.e., a result to attain and someone who attains it, you are still in the realm of duality, so it cannot be the ultimate result that transcends a duality of something to get and someone getting it. So the result - there is nothing to win and no one to win it - is the best result. Question: The word “refined” means it is gone? Question: So this means to refine it until it is gone? Translator: No, that’s just an interpretation. I think the main thing to keep in mind when we sing these songs is that we translate them and everyone who translates brings in their own notion, but when we get Rinpoche’s explanation, then you are home free and it doesn’t really matter. You just know that. It is talking about the view that is beyond the duality of seer and seeing. Question: You could have words that cause the explanation. Translator: You have to talk to Jim Scott about that. Question: It is about the point where it says, “it works quite well.” That’s a very strange thing to say - it is very strong and definite. What would be a Western way of speaking? Do Tibetans say that? Translator: It says bzang-näs-byung. bZang means "good, excellent, well" and byung means "to happen," so "it happened well" or "things came out good." Question: It’s nothing like “it works quite well,” rather it means “spot-on.” It means that it is really, strongly on the ball. To say “it works quite well” is weak and feeble. This is the real thing. Rinpoche: You should make a new translation with a new melody and make it very good. Ju Mipham, who lived from 1846-1912, was a student of Jamgon Kongtrul Lodrö Thaye the Great, Jamyang Khyentse Wangpo, and Patrul Rinpoche. Ju Mipham was one of the greatest scholars of his time. He spoke the following verse that is in harmony with what Jetsün Milarepa is teaching here. Whenever there is focus or reference on something, that is poison to the view. Whenever there is contrivance or effort, that is a fault of meditation. Whenever there is some reification of adopting and rejecting, conduct is lost. May we realize pure reality, free of pain. The last line is a little difficult, but I am explaining it to say that when something gets in your eye and it hurts, your vision is sort of affected. This term generally means any kind of pain you feel in your body that is associated with sickness, but here it is talking about wanting to achieve a flawless realization of the nature of reality. These three lines about the view, meditation, and conduct, when a focus is involved with them, then they are not perfect yet. It is the same as what Milarepa is singing about, so it is like that. Next question: When Rinpoche speaks about the view of the different schools, the Consequence School, Shentong, and Mahamudra, is he speaking about a delusion in the mental consciousness of the practitioners and how they view or is Rinpoche speaking about a delusion just in their explanation, because they are the profound view of the enlightened path? Translator: I’m not 100% clear about your question. Question: Is an advanced practitioner of the Prasangika School less involved? Is it a question of their spiritual evolution or is it a question of the evolution of their explanation of enlightenment? The second part of my question is that if you took a subject like karma, how would that apply if you took karma in each of these schools? Rinpoche: It is hard to know the extent of realization the individual proponents of the different views have, but certainly we can see that the way of examining reality, for example, from the perspective of the Prasangika School is more subtle than that of the Autonomy School. For example, the Protector Nagarjuna is said to have attained the first bodhisattva bhumi, whereas Noble Asanga attained the third bodhisattva bhumi. If one is a proponent of Rangtong, then one believes that Nagarjuna’s view is more profound than Asanga’s view, even though Asanga has a higher level of realization. And, in fact, the Buddha prophesied that Asanga and Nagarjuna would each be supreme in a different area. So, Nagarjuna was prophesied by the Buddha to be the one who would be supreme in refuting all views, and Asanga was prophesied by the Buddha to be the one who would be supreme in distinguishing between the provisional, interpretable teachings and the definitive teachings. When people who say they follow the Rangtong School accuse the Shentongpas of holding a view of realism (the extreme of permanence), then followers of Shentong turn around and say that Rangtongpas have a nihilistic view (the extreme of extinction), which occurs from the perspective of refutation and argument, trying to negate an opponent’s view. So, it’s like that. Disciples of Shengtong say that the Rangtongpas assert the existence of a fruition that is like the view of Jains, which is that fruition is nothingness. Then the Rangtongpas turn around and say that the Shentongpa’s definition of fruition is like that of the Samkya’s idea of some kind of heaven or something like that. Both can criticize the other if they intend doing so and when they do, it is with the intention of trying to find flaws in the other’s view. There are two ways of going about it. One way is looking at the other one’s faults and showing how the two views are different. The other way is looking at the good qualities of other’s views and finding out in which way they are in harmony with each other. And Jamgon Kongtrul Lodrö Thaye the Great chooses the last. So, it’s like that. Is that okay? Question: What do the Shentong and Rangtong think of the Mind-only School? Rinpoche: If you ask someone who thinks that the Prasangika School teaches the highest view, then they would say that there is no such thing as Shentong, because they say that Shentong is the same as what they consider the false Aspectarian-mind-only School. There are different sub-schools of the Mind-only School and the most profound one is what they consider the false Aspectarian School – that’s just the name. And if you talk to a proponent of the Shentong School, then that person would say, first comes the Mind-only School, then Autonomy School, then Prasangika, and Shentong at the top. So, it’s like that. Next question: "Nothing removed, nothing added.” How much of this would you take into your working life in terms of motivation, or work, or things like that? I mean, can you relate that right away to working life? Translator: Are you asking from the perspective that when we work, we are always trying to improve somehow? Student: Exactly. Surely working is the same as practising? Rinpoche: So, there’s actually an excellent way to connect this view with work, and that way is basically the view that the faults don’t really exist and all the good qualities are naturally present. So, whenever you have that view, when you look at other people, you can’t help but have a pure outlook of them, because the faults aren’t real and all the qualities are. You also gain great courage from this view. There’s no thought that there is something that cannot be dealt with or cannot be surmounted, because it is just not really there. All of apparent reality (which the Shentong School explains to be comprised of imaginary and dependent aspects of experience but basically refers to anything we think about and anything we perceive) is empty of an own essence. And genuine reality is replete with good qualities, i.e., with clarity-emptiness, bliss-emptiness, and so the point is to just relax into that understanding and to know that nothing else is real. And that’s a great way to go about the day. As to the imaginary nature really, it refers to all labels that we put on things and all of the things we think about, all the objects of our thoughts, and they don’t even appear. Not only are they not there ultimately, they are not even existent in terms of appearances, so one has no attachment whatsoever to names and labels and things like that. One person or object can have as many different names as you want, there’s no limit, because names aren’t real. Things that appear are manifestations of dependent arising; they are just mere appearances that arise through the coming together of causes and conditions, like illusions, like appearances in dreams. In the Mind-only School’s presentation, the perfectly existent nature of reality is the dependent nature, empty of the imaginary nature. So, the dependent nature, which is empty of all the names and labels we contrive and impute, is the perfectly existing nature. The Shentongpas, in contrast, explain it slightly differently by using the same three descriptions as the Mind-only School. The Shentong School teaches that the things we think about, the objects of our thoughts are the imaginary nature, i.e., the objects of our thoughts are completely fabricated, and the thoughts themselves are the dependent nature. The Shentong School teaches that thoughts arise in dependence upon habitual tendencies. Furthermore, Shentong teaches that the essential nature of thoughts is the perfectly established nature, which is mind’s clear light. If you can recognize the essential nature of a thought, then the thought itself liberates, which means you don’t have to do anything. You don’t have to try to get rid of it, you don’t have to try to make a thought stop or go away, but you just relax into the essential nature of the thought and realize its inherent freedom. According to the Mahamudra Tradition, the essential nature of every thought is clarity and emptiness, which is the same as saying that the essential nature of thought is dharmakaya. This leads to the same position as Shentong, who teach that the basic nature of every thought is the perfectly existent nature of reality. Harmony here is very helpful. So, the essential nature of unawareness is awareness. The essential nature of every mental affliction is original wisdom. The essential nature of suffering is great bliss. The essential nature of passion is bliss and emptiness. Therefore, when you bring the Shentong view into Mantrayana, into Vajrayana, then it becomes very profound. And in the text, Richös Nyedon Gyatso (“The Ocean of Definitive Meaning of Mountain Dharma”), the omniscient Dolpopa Sherab Gyaltsen doesn’t really say much about his own view; there’s not much of his own words in the text, rather it’s all quotations from the Gyulama ("The Treatise on the Buddha Nature"), from and through the Tantras, and up to the Kalachakratantra. Dolpopa just lets the quotations speak for themselves. It’s not really hard refuting the Shentong view from the perspective of Sutrayana, which teaches that the Buddha nature is steadfast, peace, and unchanging. They can always say that it is just a Sutra of provisional meaning. The Buddha said a lot of things in Sutra, statements that can be interpreted and this has only been one example. But when one looks at the same quotes in the Tantras, then it is difficult for followers of Sutrayana to say what they do; it is difficult for them to say that the Tantras present provisional and not definitive meanings. And that is the difficulty that Omniscient Dolpopa causes his opponents to face. They would have to refute all the quotes from the Tantras, which say the same thing, and especially quotes from the Kalachakra, which is considered to be the most profound Tantra. So, Dolpopa’s way of going about this is like flying an airplane that takes off from the Sutrayana level of view; at that stage one might still be able to manoeuvre the plane because it is not soaring yet. But when Dolpopa brings in all the quotes from the Tantras, then the airplane is way up in the sky and all one can do is just look at it. So, when he offers quotations from the Gyulama, then it is as though the plane hasn’t reached the open sky yet and the Rangtongpas still try to refute that. But when he starts quoting the Tantras, like Reciting theNames of Manjushri and other Tantric texts, and especially when he reaches up to the Kalachakratantra and offers quotes, then the plane is simply flying in the open sky and one cannot bring it down. The reason opponents can’t do anything at that stage is because Rangtongpas and Shentongpas both say that they are Vajrayana practitioners. They are and therefore they cannot refute the Vajrayana teachings. If they weren’t Vajrayana practitioners, then they might still be able to say something, but they all assert that Vajrayana is the highest teaching of the Buddha, so what are they going to do? That’s how it is. Rinpoche: Sometimes you need to put a lot of effort into practice and sometimes you need to take it easy, so both are important. For example, when you are going through exams and are not relaxed but too tense, you might forget all the things you studied because you are too tight. That’s the time you need to be relaxed. But other times you need to be focused and put in a lot of effort, so it depends upon the situation. Beginners need to put in effort, in the middle you relax a bit, and at the end you are perfectly relaxed. But again, if you are too attached to relaxation, then you become tight, so you are relaxed without being attached. It is just like when you first learn to drive a car. When you first learn to drive a car, you are very, very conscientious and have to be, otherwise you won’t know what to do. But once you have learned how to drive, you can be relaxed and drive naturally. But if you are too relaxed while driving a car, that can be a problem too. That’s why it is said in the meditation instructions: "Let go and relax - tighten up and be alert." So, it has both qualities. The same two notions can be found in the three classic Mahamudra instructions, which are: No distraction, no meditation, let go and relax. Relax but do not be attached to relaxation. It’s like that. Question: How can one let go? Because it seems to me that even if I am paying attention and not occupied with thoughts, my mind is still automatically creating thoughts all the time. It doesn’t seem to give up. going with six consciousnesses, free all by themselves. this is the way to rest in the heart-essence. this is the way to eat without perceiver or perceived. this is the way to drink that never ever ends. this is virtuous practice without sessions or breaks. Therefore, whatever thought it is, just look straight at it, let go, and relax. That’s Mahamudra. It is possible that, since it is so easy, one won’t have confidence in it and concludes, "That’s just too simple. It can’t be that simple." Thinking like that, we won’t want to do it because we think that it is too easy. These songs were sung, so therefore they carry much more power when we put them to melody than if we just say them in ordinary speech. It’s not true for everybody. Most people say that they like to sing; some people say they don’t. Next question: Earlier Rinpoche said something about just singing the melody, that the melody has power too. Could you speak a little about the power of melody alone? Translator: Do you mean just without the words? Student: In conjunction with the words, but why are particular melodies stronger if they are Tibetan? Translator: Do you mean in terms of some melodies being stronger than others? Student: Yes, why particularly when you sing the tune to make the words speak more? Rinpoche: It depends upon an individual’s perception. If you say, "This particular melody is the right one, has the greatest power," then you turn it into something that truly exists. Why is it objectively better? It can’t be. It just depends upon an individual’s interest and faith. If someone has faith in a melody and really likes it, then it is powerful for that person. In Vajrayana, there are different extraordinary melodies. You are probably familiar with the very deep and resonant way that the monks in Tantric colleges sing. It is an extraordinary melody. The Kagyupas, Nyingmapas, and Sakyapas each have their own way of singing. Ju Mipham Rinpoche said, "In analysing the different ways in which the lineages sing, Gelugpa melodies come from the stomach, Nyingmapa melodies are nasal, Kagyupa melodies come from the throat, and Sakyapa melodies come from the lips." But that’s not a definitive statement because some parts of melodies can be sung from the belly and some parts of the same melody from the nose. Ju Mipham Rinpoche just gave an overall description. Similarly, all religious traditions have their own songs and sing them. Student: Why are words more powerful when sung than when spoken? Rinpoche: Maybe it is because the Kagyupas like to sing. Milarepa sang so many songs - he loved to sing. When Kagyupas have a big festival or when mountain retreatants get together, they just sing Milarepa’s songs for 12 hours straight and have a great time. Take The Collection of Kagyu Vajra Songs, translated into English as The Rain of Wisdom by Trungpa Rinpoche´s students. This collection contains songs from the first Kagyu Siddhas, starting from Tilopa and Naropa, and goes all the way through. Members of the community will sing these songs all day long. So, it’s like that. Christians like to sing in their churches, too. Another reason is that when you sing, you have a chance to think about what the words mean and to meditate at the same time. In Vajrayana pujas, when the meaning and visualization become especially profound, that’s the time to sing, because it is an aid to meditation. So, it’s like that. Yes. Next question: I was wondering about dependent reality, the imaginary reality, and genuine reality. I can see how appearances are outside of my perception, like the bottom of the ocean, how the dependent reality is like an illusion, dependent arising. But what about genuine reality? Is that like the nature of mind, which is outside my perception? Rinpoche: We can apply inferential reasoning to the appearances that we can’t see just as we do with the things we see. For example, we see flowers in front of us. We can analyse and determine that they are illusory, and we should analyse things we can’t see in order to determine that they are also illusory. You asked, "How can you consider the essential nature of the bottom of the ocean to be the true nature of mind if we don’t perceive it directly?" The answer is that you don’t perceive the image directly but you perceive its existence and that’s your mental perception, thinking that it exists, thinking about its qualities, and so forth. You also perceive what doesn’t exist. The word “existence” is a thought and the word “non-existence” is a thought. Having a perceptual vision of something is a thought, and having a vision without a perception of something is also a thought. The nature of all of that is the clear light nature of mind. There is a concept that something is there, and the essential nature of that concept is mind’s clear light nature of mind. So, it’s like that. Rinpoche: This way of explaining mind comes from the traditions that assert the existence of what is called "self-awareness," meaning mind experiencing itself, its own nature. So in any moment of mind you have the mind-aspect that is experiencing the outer object and the mind-aspect that is experiencing its experience of that object, i.e., the mind experiencing itself, the inward-facing aspect. So that’s how they explain it to be. The outward-facing aspect is what experiences all the objects that one perceives. The inward-facing aspect is our own experience, our own experience of our own mind. Knowing what is going on in one’s own mind is self-awareness. So, from that perspective it is very difficult not to assert the existence of self-awareness - you kind of have to, at least in a conventional sense. For example, if you experience your skin touching something, then the outward-facing aspect experiences that contact as being soft, or rough, or whatever. Then the inward-facing aspect experiences the essence of that contact, i.e., mind’s experience of itself during that experience. The Sutra School, called Sautrantika, asserts that the mind that is focused on outer objects is valid cognition and that the mind that is focused on the inner experience is also valid cognition. The Mind-only School, called Cittamatrin, doesn’t assert the existence of outer objects in terms of genuine reality, but they have to do so conventionally; they have to at least say that outer objects appear, otherwise they would be like a bunch of blind people who wouldn’t experience anything. According to the Rangtong School, both inward and outward-facing aspects are empty of an own essence, because they are neither one thing nor many things. The Rangtongpas do not assert the existence of either the outer-facing nor inner-facing aspects, but if we look at the sixteen emptinesses, then one of the four that summarizes them is called "emptiness of other thing." The “other thing” they speak about is genuine reality that is not perceived by the sense consciousnesses, not perceived by ordinary consciousness in any way that we can recognize it, because it is the object of self-arisen, original wisdom. When they start talking about self-arisen, original wisdom, they get more into the Shentong explanation, so we can see harmony there. The way that the sixteen emptinesses are condensed and summarized into four is first carried out by validating emptiness of things, i.e., all things are empty of an own nature. Then nothing, like if there is nothing; that’s also emptiness and is the second point. The third emptiness is the emptiness of the true nature, meaning that there is the true nature of reality, which is also empty. Finally, the fourth one is the emptiness of the other thing. When we get to the emptiness of the other thing, we are in harmony with the Shentong view. Translator: It is the nature of genuine reality. It is called "other" literally because it is other than anything we experience in our confused state as a sentient being. Rinpoche: In the Bodhicharyavatara, Shantideva explains: "Genuine reality is not the object of experience of the intellect. If it is something that is conceived, then it is relative." That’s what the other thing is; the other thing is beyond ordinary consciousness. It is the object of original wisdom, jnana. Question: Do you find it in Shentong? Translator: No, different. The explanation is that this “other thing,” i.e., ultimate truth, is an experience that is realized by primordial wisdom, and that’s the connection with Shentong, because Shentong asserts the existence of primordial wisdom. Rinpoche: Let us take the example of two people wanting to circumambulate a temple and who approach it from opposite directions. They meet at the door, can go inside and look at the deities together. Similarly, proponents of Rangtong and Shentong approach emptiness from different angles, but then they reach emptiness of “the other thing,” talk in a Shentong way, and end up with emptiness and clarity. And then they look at the space in a temple and see all the beautiful statues of deities. Similarly, when one looks through the expanse of awareness, then one sees its depth, which is radiant clarity that enables the deities to appear. But we have to understand that this is just an example, because we are talking about seeing something with one’s eyes in a temple, but emptiness is not something one sees with one’s eyes – primordial wisdom transcends someone seeing something. Therefore, when one investigates existents and reaches the end, one can’t find anything nor does one find nothing. One continues by investigating non-existence and gets to the end of that – then one finds the existence of clear light. And this is how it really is. Once a nuclear physicist told me that the way nuclear power works is that you end up with the tiniest, tiniest particles and their connections have the greatest power, so that when you split them, then the tiny connection turns into massive energy that splits all surrounding connections. One ends up with a huge nuclear explosion. That’s how they explain it. Therefore, the true reality of the way the very subtle particles function is inconceivable. In the Buddhist tradition, four things are said to be inconceivable. One of them is the power of Mantra, another is the power of substances like medicine, and another one is the potency of matter. What they really are is inconceivable. It’s like that. Now let’s sing The Song of Mahamudra. Jetsun Milarepa sings of the six different ways to rest in the basic nature in this song, and we need to be familiar with them. Even in the most extensive commentaries of Mahamudra, you won’t find anything more profound or anything that is left out of these six different ways of resting. I rest without struggle in actual real being. I rest in a clarity cradled in emptiness-space. I rest in awareness and this is blissful space. I rest unruffled in non-conceptual space. In variety’s space I rest in equipoise. I’m resting and this is naked mind itself. In this way, we find the six different ways of resting, and even in the most extensive commentaries on Mahamudra, you won’t find more than what is expressed here, so that’s why this song is so incredibly profound and is so concise. An emanation of Jetsün Milarepa manifested and his name was Gyalwa Gotsangpa. Gyalwa Gotsangpa (1189-1258) spread the Kagyu Drukpa tradition in West Tibet and his followers came to be known as disciples of the Upper Drukpa School. A 13 th century shrine was erected in the mountains behind the Monastery of Hemis in Ladakh where Gyalwa Gotsangpa meditated in a cave. His footprint and handprint can still be seen on a rock there. He sang a song called The Eight Cases of Basic Goodness not to be Shunned. The basic goodness of sickness not to be shunned is very important, so it would be good for you to write it down. relax into it, fresh and uncontrived. pain and illness are basically good. As long as one doesn’t analyse, then the pain of an illness appears to have a basis and seems to be located somewhere in the body. It is possible to point to a spot and say, "It hurts right here." But when one analyses more subtly, one can’t find sickness anywhere. In fact, an illness has no base, no root, no ground. Discovering that, one can just relax into this baseless-ness and rootless-ness. And this experience is the fresh and non-contrived nature of mind. So that’s why Gyalwa Gotsangpa wrote, "Relax into it, fresh and uncontrived." What does "Revealing dharmakaya, way beyond all speech and thought" mean? The experience of resting relaxed and non-contrived in the baseless and rootless true nature of sickness is inexpressible, inconceivable, and that is the dharmakaya, the true nature of sickness. Since the dharmakaya is the true nature of sickness, there is no need to give it up nor get rid of it. One can carry out the same analysis with particles and discover that there is nothing really there to point to. One can carry out the same analysis with one’s body. When one has analysed a sickness, in the end one can’t find anything. Even if one stops analysing at a subtle particle level, subtle particles have no feeling of sickness. So the body is just a bunch of subtle particles that don’t care. The subtle particles that make up one’s body don’t have the thought, "I am sick or not." One can go even further than that and see that the subtle particles don’t exist either. All appearances of the relative world are empty, sicknesses too. One needs to understand that the essential nature of the thought, “I am sick” is clear light in order to meditate. Meditating on the essential nature of sickness itself is the tradition of Rangtong. Meditating on the essential nature of the thought, “I am sick” – clear light - is Shentong. Realizing the indivisibility of appearances and mind is Mahamudra; realizing that there is no duality in terms of mind and appearances is Mahamudra. Therefore, from among the eight cases of basic goodness not to be shunned, the basic goodness of sickness not to be shunned is very important. If one can understand this, then one can understand that sickness is actually a friend of one’s meditation – sickness is actually what one meditates on. Translator: I will sing the verse Gyalwa Gotsangpa wrote one time through and then we will sing it together. Rinpoche: We will sing it three times after the translator sings it once. When Gyalwa Gotsangpa was meditating in the mountains, he got sick a lot. There were no doctors up there and certainly no hospitals. He didn’t go down to the valley to find any, but stayed in the mountains and meditated upon the essential nature of his sickness. By doing so, he had a wonderful support for his meditation. He attained realization, and when he attained realization, he recovered. He sang many songs about taking illness onto the path. 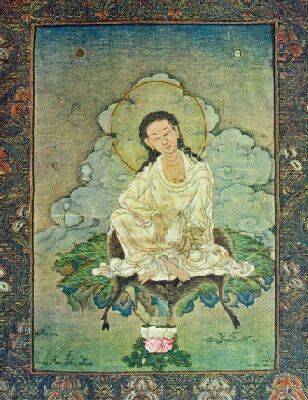 Jetsun Milarepa, on the other hand, underwent most of his austerities while he served his teacher Marpa. He had to build four towers, which symbolize the four karmic activities of pacifying, enriching, magnetizing, and destroying. When he went off to practice, he didn’t get sick much, so he didn’t sing too many songs about taking sickness onto the path. And so, it is better if things go badly than good when we practice Dharma, because when things go badly, one remembers to practice – one has to. Whereas when things go well, it is easy to get distracted and forget about the essential practice. Milarepa himself sang a verse along these lines that goes: "For me adverse circumstances have been incredibly kind. I don't know about other people, but for me they have been great." It’s like that. Next question: You spoke about physical illness. What about mental illness, when the mind experiences fear or anguish? Rinpoche: The best thing to do is work when your mind gets very agitated, because when you work you have to focus and don’t have a lot of time to think about other things. So it is best to integrate practice with work when you are in that state. And if you do different kinds of yogic exercises like Taichi, then that benefits both body and mind. Milarepa sang: "When you are feeling down, go begging. The self-liberation of all these different lands is a wonderful miracle." This is the Tibetan tradition. If one’s mind feels depressed or agitated, then one would go for a nice beg. One could go around begging for many years and experience all different kinds of difficulties, like trudging through the heat, suffering in the cold, and when all those things happened, one’s mind would feel much better. So that was Milarepa’s advice. Sometimes practitioners would stay in retreat in the mountains for many years. They would get sort of tight and it would be difficult for them to loosen up. When that happened, they would just go on pilgrimage. They would go to Mt. Kailash, begging along the way. It might take a year or two, but during that process their mind would become much more relaxed. For people like us to gain the same experience of equal-taste, we should go to places like Pashupatinath near Kathmandu or Varanasi that is situated along the Ganges River and watch the cremation ceremonies of dead bodies. In those places, every morning about 20 corpses are brought and people there make big bonfires. After the corpse has burned, they throw the ashes and whatever is left over when the fires go out into the river. Watching that when the mind is in anguish will help one’s experience. It’s good to have some experience of difficulties. So, it’s like that. Look directly into the essence of happiness and rest relaxed within bliss-emptiness. Look directly into the essence of pain and rest relaxed within clarity-emptiness. A remedy for laziness is exercising the body forcefully through yoga or gym. When one does that, then the body feels good and the mind feels good. In Europe and America there are many ways to do yogic exercises, like Taichi. Let body take control of the mind in exercise. This means to say that when one exercises one’s body and moves around, then one’s mind naturally has some focus and it doesn’t have much time to think about a lot of other things. Let mind take control over body. This means to say that when one’s mind feels overjoyed, feels ecstatic at the prospect of vigorous exercise, then one will do it and will not think, "Oh, my body won’t take that." Both body and mind then become flexible. There was one particular exercise in Tibet that one did when one became a victim of srog-rlung, a state of being extremely anxious and feeling mental tension. One visualizes a dark-blue HUNG that is filled with the entire gunk in the centre of one’s heart. Furthermore, one visualizes a beautiful white one up in the sky. One sort of crouches down and when one stands up, one expels the entire gunk, all the blue goes out into the one above. The white one out there becomes progressively blue. As you keep doing this over and over again, the one inside your heart becomes more and more white, until you have the pure white one in your heart and the one above is filled with all the garbage. Then one dissolves the meditation completely and rests without any reference-point. This was a traditional Tibetan exercise. People who studied a lot and became very anxious and tight as a result did that. People who meditated a lot and got anxious and tight as a result did it too. It’s a very good exercise So you should do that too. Question: Where is the blue, where do you see it, in the body or? Translator: It’s in the HUNG that is in your heart. When you expel it, it goes out. Question: Where does it go out, through the head? Question : What is a HUNG? I don’t know. Translator: HUNG is a Tibetan and Sanskrit syllable, like OM MANI PEDME HUNG. Rinpoche: You can just visualize HUNG in your heart. It is no problem. Student : Do you crouch down and then come up like that? Translator breaths out strongly three times and says, "Hah, hah, hah." 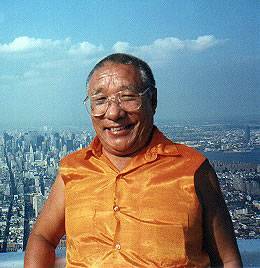 Rinpoche: Then you can do some visualization and exercise to get the "Hah-hah." Question: Do you make any different sound or noise? Rinpoche: The sound isn’t as important as the forceful exhalation. If you really want to get that gone, that’s the most important part. You are making a sound and do need not to scream. You can say, "Hah" from deep down in your stomach, making that noise while you are breathing out. It’s good to do it outside if you can, while looking up into the blue sky. Now we are going to meditate while we sing and need not make the meditation different from singing the song. The Tibetan way of doing the ritual practice was that they would recite for 12 hours straight, reciting the puja, singing the puja, and meditating at the same time. When they would get to the end of the puja, the actual completion stage practice would only last a few minutes. It wouldn’t need to last longer, because they would have been meditating the whole time. If the non-referential meditation lasted too long, the young monks would fall asleep and that would be a problem. The meditation master would probably think, "If I let this meditation go on too long, then the young monks will fall asleep and the discipline master will come and smack them. That wouldn’t be good. I won’t make the meditation too long.” So, they would meditate while they were reciting the puja. We are going to do the same and meditate while we sing. By the power of inspiration, those residing in the Buddha fields of the ten directions, may our true heart-friend of goodness stand unstained like a lotus steadfast among us, his enlightened activity pervading the bounds of space in all directions. Through this goodness may omniscience be attained, evil enemies be defeated, and may beings be liberated from the ocean of samsara which is agitated by the waves of ageing, sickness, and death. My parting aspiration for you all is that you will perfect the knowledge gained from listening, reflecting, and meditating on the genuine Dharma and through that be of great benefit to all of the limitless number of sentient beings. May the confusion of the imaginary and dependent natures dissolve in the expanse, and may the sun of the perfectly existing nature shine from your hearts. One person can inspire another and when one person receives great blessings, then the blessings from one person can spread to an entire group. When many people get together, there is also an extraordinary power to that. So, that’s why it’s good to meet from time to time. exception swiftly establish the levels and grounds of Buddhahood. Instructions presented at Vajra Vidya Thrangu House in Oxford, 2000. Translated by Ari Goldfield. Transcribed in 2001 and edited by Gaby Hollmann for Karma Lekshey Ling Institute in 2007. Photos of Jetsün Milarepa and Gyalwa Gotsangpa courtesy of Himalayan Art Resources; photo of Khenpo from Venerable Khenpo Gyatso Rinpoche.